While the Joy family has been poultry farming in Surrey since 1930, there has been a recent change in how our Christmas turkeys have been finding their way from farm to plate. "Our butchers' trade has actually started to decrease year-on-year but our farm gate sales to the public have increased dramatically," says Adrian Joy, the third generation of the family to run the business in West Horsley, near Guildford. "We're lucky that we have some customers who have been visiting us for their turkey for more than 50 years, but we've even had people come all the way up from the coast or down from London to collect their bird. Many of whom have only recently heard about us for the first time." While many glossy magazines champion quirky alternatives to turkey as they fill their festive pages, this humble bird remains the star for many British people's Christmas celebrations. "There's such a foodie culture that has developed in Britain in recent years and that can only help farmers like us, who put the welfare of the animals high on the agenda," says Adrian. "Our country took a long time to change from the necessity of a pre and post-war 'cheap to feed the many' philosophy to one where people put more thought into where their food comes from. Whether it's because of people having more disposable income or ethical choices, it definitely feels like that is changing. "A lot of our customers like the fact they are buying from the farm down the road and those who live further away love that our birds are well looked after. Once our turkeys are old enough, they spend their days out in the fields - and you can see the difference in the character of the animals." Turkey farming is not for the faint-hearted around Thanksgiving and Christmas, as the orders and requests pour in – but a busy business is the reward for a long year of hard work at the farm. "At this time of the year, we have really long days - I'll often be up from 4.30am and then I'll still be processing orders or checking that everything is as it should be on the farm long into the night," he says. "I wouldn't have it any other way though." While Bramble Farm starts to sell out of some turkey sizes in the weeks running up to Christmas, there is still some availability until closer to the big day for those looking to add the perfect centrepiece to their Christmas feast. 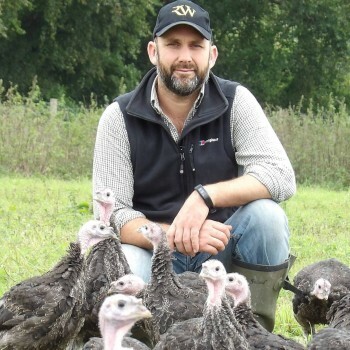 "It makes such a difference having a free-range turkey, as the muscles on the bird have developed properly and so have more flavour," says Adrian. "Our biggest birds this year were size 11-12, which would feed around 24 people - depending on how hungry they are, of course!" So while you're enjoying your Christmas dinner this year, make sure to raise a glass in thanks to a farming family who are bringing joy to so many this festive season.